When couples discuss having children, they typically think about names, sleepless nights, finances, schools… The last thing they think about is their broadband connectivity. And that is OK. Until children become teenagers. Have you ever wondered what the effect is of adding a teenager per home? In my experience, it is at least one additional smartphone, one tablet, possibly even a TV, and a higher tier broadband subscription. Teenagers are highly adept at digital multitasking and hogging the home Wi-Fi. And they are responsible for a significant portion of the increased unicast video traffic on our broadband networks. As the world’s population grows and ages, these digital natives are becoming the demographic with the most digital devices and the biggest consumers of bandwidth. Understanding future bandwidth demand is crucial for operators trying to choose the right access technology for network upgrades. How long can the current installed base cope with growing demand? What are peak-throughput applications and multi-screen consumption doing to the bandwidth? And how will they evolve over time? 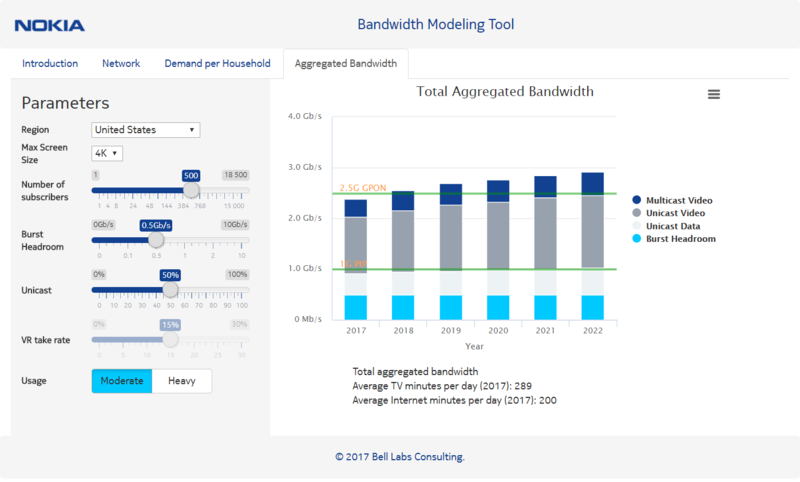 Nokia’s new bandwidth modeling tool, created by experts from Nokia Bell Labs and our Fixed Networks CTO, can help telcos, cablecos, community broadband operators and others calculate how much bandwidth their networks will need. The tool calculates demand for a single household or aggregated bandwidth for an area. It estimates peak and sustained throughput, considers user behavior statistics in different regions, the impact of disruptive services and sudden bandwidth-hungry activities. You can see the effect of moving from 2K to 4K TVs, or from 4K to 8K, and what happens with the growth of unicast traffic or burst headroom. Or you can use it to calculate the capacity needs for a new suburb that is being built. Video traffic will continue to dominate. The backhaul of remote nodes (like G.fast) will require multi-gigabit Ethernet or GPON technology. However, in the US, nodes with 48 users or more will need 10G backhaul from 2022. GPON and XGS-PON technologies will provide enough bandwidth for FTTH deployments. HFC networks, due to larger service groups, will need to evolve quickly and significantly if they are to provide all-IP video and 1 Gb/s services. They may need spectrum allocation and some combination of fiber node splitting and deeper fiber. Whatever your network capacity needs may be, Nokia technologies can help you address them in the most cost-efficient way. Find out more about our newest FTTx technology: Wireless PON. Of course, teenagers are only part of the equation, but their impact on broadband demand is very real. So, think about your family’s broadband consumption and the effect of all those teenagers on our access networks. Then go and try out our modeling tool: input details about your service areas, experiment with different permutations of devices, subscribers and behaviors, and get the insight you need into your own future network requirements.